Everyone (well, nearly) loves sushi! Whether you love it or get queasy at the thought of raw fish, sushi has gained incredible popularity since first being served in the United States in the mid-1960s. At once a rare and pricey delicacy, today most Vermonters can find sushi at their local grocery store or Chinese restaurants where you can order a California roll along side an order of General Tso chicken. Authentic? No, but the westernization of this traditional Southeast Asian meal is part of what makes sushi such a fascinating topic for students to explore through project-based learning. This article highlights some resources to share with students to get started on a discussion of real-world problems surrounding sustainability and food security in Japan and Southeast Asia. In the 2011 documentary, “Jiro Dreams of Sushi”, the audience is welcomed into the world and kitchen of Jiro Ono, considered by many to be the world’s greatest sushi chef. Sharing this documentary in the classroom allows students to see the dedication and art that surrounds this traditional Japanese cuisine, but then a real world problem emerges. The fish that were once used to make traditional sushi are disappearing because of overfishing and unsustainable fishing practices. Following this documentary, students can dive into the question of whether we can eat sushi sustainably. The fish is only part of the sushi recipe. An exploration into the topic of rice in Asia brings a whole new series of real-world concerns that students can tackle. The TED Talk by Pamela Ronald makes the case for engineering our food, arguing that sometimes the most effective way to advance agriculture and enhance food security. At the same time in Japan, a nation that is eating less rice than it did 30 years ago, some are calling into question whether the country can afford subsidies that have kept farmers in business. Students can read about the “Abenomics” in the rice paddy and develop new free-trade policies. 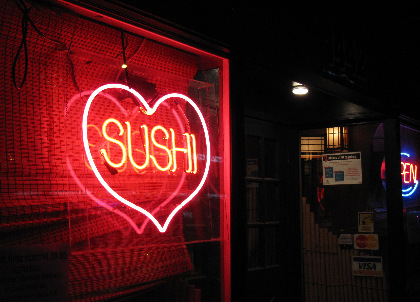 Have your students explored the sustainability of sushi? Contact us, because we want to know what their solutions are to these real world problems!